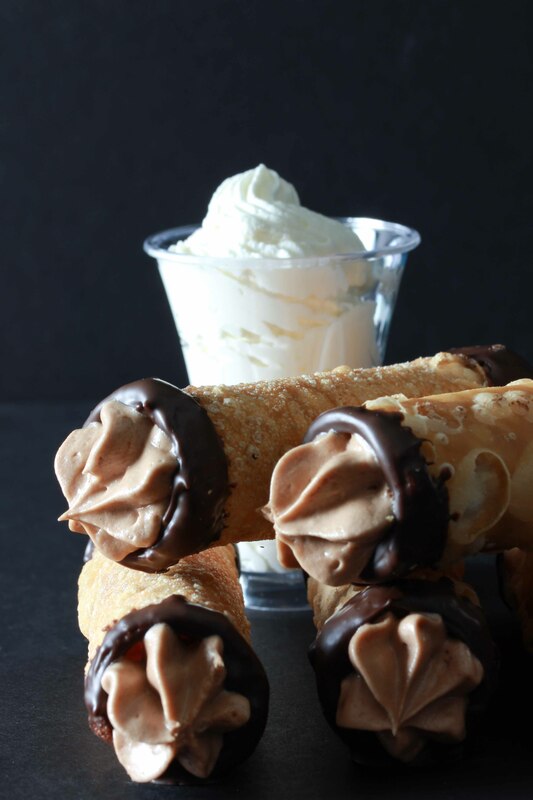 Shortcut Cannoli with Chocolate Mousse Filling and a Hanukkah Blog Party! 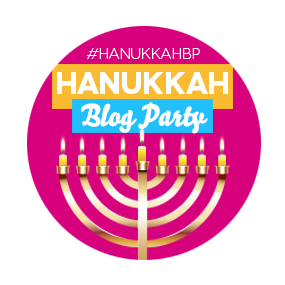 A Hanukkah Blog Party! Scroll down past the party info for the most delicious dessert recipe you’ve ever tasted. No jokes. PS: in honor of Chanukah, I totally deep fried it! Let’s get some details, shall we? Welcome to our first ever Hanukkah Blog Party, hosted by Leah of Cook Kosher and Miriam of Overtime Cook. It’s traditional on Hanukkah to eat fried treats, most notably donuts and latkes, and we’ve got a fabulous array of Hanukkah themed recipes, treats and crafts from Jewish bloggers all over the world! Scroll down for links to all of the delicious treats. (sponsored by Artscroll) Reviewed by me here. (sponsored by the author) Reviewed by me here. How to enter: Leave a comment on this post telling me what your favorite fried treat is! Scroll past the recipe for lots of other amazing chanuka recipes! And now let’s talk Cannoli. Sometimes I feel like it’s a very good thing that I don’t have an Italian granmother, because she might be really angry at me for calling this recipe a cannoli. I am pretty sure that a real italian would be completely scandalized by the concept of a shortcut in cannoli making. But let’s get real, shall we? I am not Italian. I don’t possess a pasta roller, nor do I possess the energy or time to sit there rolling out cannoli dough as thin as pasta with nothing but my rolling pin. And y’all know how I am totally not into buying premade things, but I made an exception here. You’re going to be deep frying the dough, and you’re going to make a dreamy-creamy-sinfully amazing filling, nobody will complain if you start with something out of your grocery’s freezer. My secret: wonton wrappers! You got it! They are already super thin, and they fry up really nicely (just ask your local Asian restaurant). Trust me. 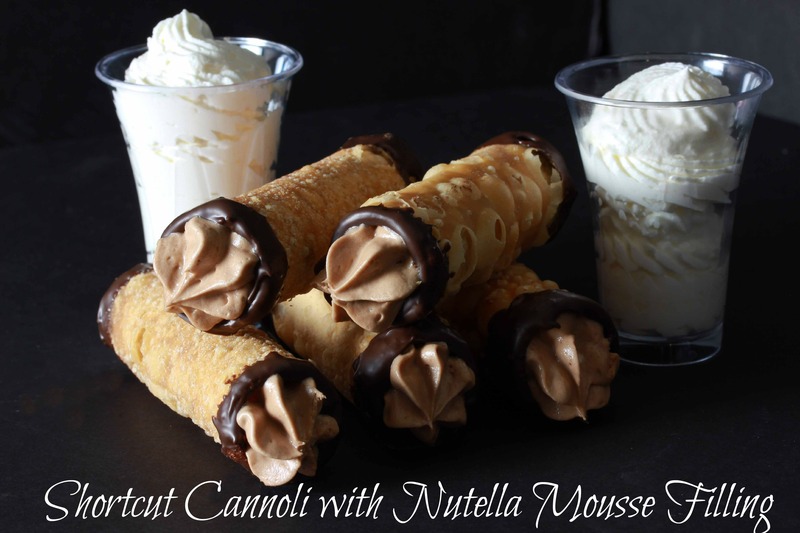 You will completely rethink cannoli once you try this. Now let’s talk filling. I have made “cannoli” in the past (using store bought wafer “shells” and filled them with lightly sweetened whipped cream. But this time I decided to take things a step further. I made the most amazing mousse filling for these. I don’t know that there are adequate words in the English language to describe this filling, so make it and you will see what I am talking about. Heat about 2-3 inches of oil in a deep frying pan over medium heat. Meanwhile, prepare the cannoli shells: wrap a wonton wrapper around a cannoli form tightly. Dip your finger in water and rub along the edges. Press well to seal. (If the wrapper isn’t tight enough, or the seam isn’t sealed well enough, the shell will open while frying.) Repeat with all remaining cannoli forms. Before frying, test that the oil is hot enough. Place a small piece of wonton wrapper in the oil- if it rises immediately it’s ready for frying. Fry 3-4 cannoli at a time, depending on the size of your frying pan. Don’t overcrowd the pan or they will open. Fry the cannoli for a couple of minutes (about 2-4) until they are golden brown. Remove from pan and place on paper towel to drain the oil, then set aside to cool. When cooled enough to handle, gently remove the cannoli from the form, and repeat with the remaining wrappers. 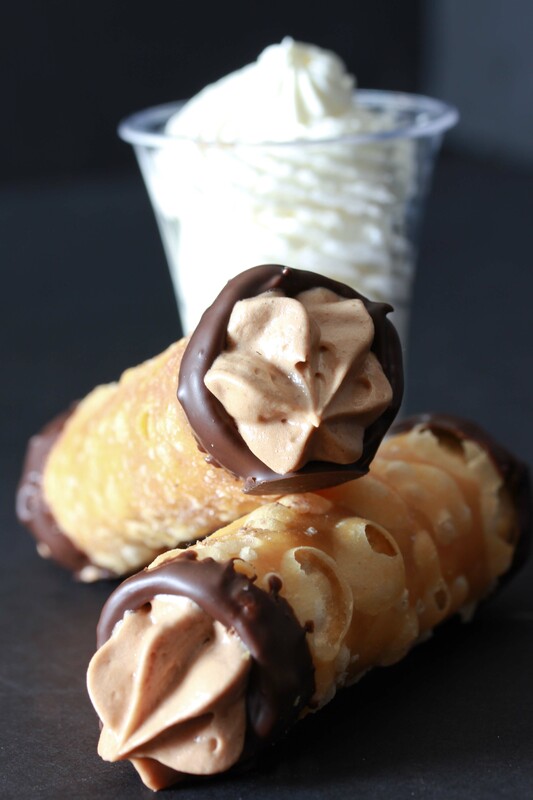 Once all cannoli have been fried, cooled and removed from the forms, dip the ends in melted chocolate, if desired. Place the dipped cannoli shells on parchment paper to set. At this point you can store the shells in an airtight container for a day or two, or even freeze for later use. Or you can fill immediately, but then you need to serve the within a couple of hours. In the bowl of your electric mixer, using the whisk attachment, beat the cream or whip until stiff. (If using extra for garnish, you can whip it together to save time.) Remove whipped cream from mixer and set aside. In the bowl of the electric mixer (no need to wash it between this and the previous use) beat together the chocolate-hazelnut spread, cream cheese and vanilla until combined. Using a rubber spatula, gently fold in the cream (if whipped extra for garnish only use 2/3 of the total amount). Stir gently until all of the cream has been incorporated. Within a couple of hours before serving the cannoli, fill the shells with the mousse. To get the look in the picture, fit a piping bag with a Wilton 1M piping tip and fill it with mousse. Pipe some mouse in to one end of the cannoli shell, ending with a nice tip, then turn around a fill the other end, again ending in a nice tip. Otherwise, just place the mousse in a bag, snip off the end, and pipe it into the shells. Serve the cannoli within a few hours of filling them, alongside the reserved whipped cream. Aren’t these the most beautiful and delicious looking little treats? You know you want to make them! Thank you, as always, for stopping by, and make sure to enter my giveaway, then click on all the links above for more amazing recipes and lots of chances to win! Happy Chanukkah, Hanukkah, or however else you say it to all my Jewish Friends and readers! -Miriam PS- come back soon for a super cool latke recipe! Thank you so much for inviting me to participate! Happy Hanukkah! And my fav fried treat is funnel cakes! yum! those cannolis look awesome! Happy Chanukah! Definitely suganiyot and my husbands potato balls (I know random) hope I win!! my favorite fried treat is tempura sushi! yum…. your recipe looks amazing! happy chanukah! I never thought of using a wonton wrapper. What an inspired idea! I was going to say fried latkes. Yet when I saw Blima comment saying her favorite fried food is french fries, I have to admit that that is my absolute favorite fried food all year round. My favorite fried food is donuts and latkes. Thank you for the wonderful post. I really enjoy reading your blog. Thank you for your cook book reviews. I can’t wait to try Susie Fishbein’s Yemenite soup. Oh my gahhhhhh. Rolling out cannoli dough by hand with a pin was what was keeping me from cannoling. You are a genius, and I am going to impress the smack out of coworkers with these later this week, I hope! So pretty! Thanks for hosting the blog party!! My favorite fried food is french fries, but in the spirit of Hanukkah, my second favorite is latkes. This looks yum! Caramel sufganiyot are our family fav’s! Great Idea. I love fried doughnuts…nothing beats them! My favorite fried chanukah food is doughnuts!! so fun! your cannoli looks UNbelievable! my favorite fried food is arancini!!! Thanks for hosting this blog party and inviting me. It must have been a lot of work. Fried food is not on my agenda this year. I love frank n jackets! Thank you so much for hosting this wonderful event. I love that this recipe is so easy. No need to mess with a dough recipe. They look absolutely sinful. Cannoli with won ton wrappers! Brilliant. They look amazing. My favorite fried food is grilled cheese, omg! Thanks for hosting such a great event, happy to be part of it. Happy Hanukkah! Thanks for hosting the Chanukah blog party! All these recipes sound mouth watering cant wait to try them!! All the recipe sound amazing! And the cannoli’s especially! my favorite fried food…potato latkas! These recipes sound good, but my favorite is still a simple chocolate-cream filled doughnut! Yummy. I love poato latkas, donuts, churros & won tons! French fried are my favorite fried foods!! OMG those cannoli look so yummy! My favorite fried food is beignets (sorta like zeppoli, but from New Orleans). My favorite just became your cannolis! looks yum! i love french fries and latkes, anything fried is really awesome! I love deep fried French fries! Do French fries count? Love those! Best fried food is jalapeno poppers. I can never have enough of them. Happy Chanukah! My favorite fried food is falafel crusted chicken! Happy Chanukah! Maybe falafel balls. I’m not so into frying in general but those just don’t come out right any other way. Other things substitutes work ok.
my favorite fried food is donuts! boston cream or caramel… when I was in seminary, my friends and I had a donut eating contest for the month that they are sold… I came very close to winning! Although I’m working on being healthy and not eating fried foods, my all time favorite, and most difficult to resist, is definitely grated potato latkes. Those cannolis look awesome! I recently had pancake poppers from Spoons in Flatbush, & they are soooo good that I will NOT make them cuz I don’t want to get fat, but they are a great once-in-a-blue-moon treat. Latkes–definitely my favorite fried food! Too many to choose, but I think I’ll go with egg rolls! OMG i need to make these or have someone make them for me….ahhhhh! so good..so good! Schnitzel, eggrolls, doughnuts, latkes. Basically anything fried! Thanks for another chance to win! Latkes are my favorite. Hope to win one of the cookbooks–I love trying new recipes! Miriam-these pictures alone are making me drool.I cant wait to try this recipe. Thanks again for inviting me to join…….. I love love love beef eggrolls!!! Favorite fried food. Fried chicken cutlets. But enjoyed the fried food at this party. No pain no gain! You had me at “Nutella Mousse.” Yum. I am all for shortcuts! Very unique and creative idea, my mouth was watering as I was reading the recipe and looking at the pictures. Amazing Job! Love this blog! My favorite chanukah fried food is custard donuts! Favorite fried food? Cannolis – too bad I ouldn’t find a worthy filling recipe to make them myself so I haven’t had them since I started keeping kosher… oh wait. Haha, I’m going to have a parTAY with this. You’re all invited, but if you don’t show up, I’ll muddle through somehow and eat your cannolis for you. Looking forward to the chance to win one of these books for more ideas! favorite fried food: sounds weird but I really love shnitzel! I will admit, despite living in Scotland for awhile, I could never get into fried Mars bars. Probably my favourite fried food is chicken! I don’t know whats more my favorite, my family’s sufganiot or deep-fried breaded halloumi cheese! My fav fried food if corn dogs !!! Sufganiyot! But after being seduced by your gorgeous post I may say cannoli! I don’t think my first post took! My most fav is fried corn dogs !!! Deep fried brussels sprouts. I had them for my birthday at a restaurant in Pittsburgh and I’m currently obsessed. Potato Latkes are still number one! Nothing beats them straight out of the pan… although I am waiting to taste some funnel cakes at the party…. These look fantastic! I’m not really a big fried-food fan, but these sound great. These look delicious. I love Cannolis. Happy chanukah! Tnx for all the great recipes. My favorite chanukah fried food is Jelly donuts! Since forever! churros are my favorite fried treat! These look heavenly! I wouldn’t eat them and I could hardly make them but they’re gorgeous to dream about! These cannolis look heavenly, happy chanukah! I love donuts.. these look so delicious too! Those cannolis look amazing…. but my favorite fried treat is doughnuts with custard filling! beer battered onion rings all the way! These look great! My favorite fried food is latkas. I’m usually more of a savory person so I’d say egg rolls, but I can’t wait to try your funnel cakes this week! Latkes are by far my favorite Chanukah food! My favorite fried food is shnitzel! You mean I’m not the only Jewish person that loves eggnog?! I will have to try those sufganiyot, thank you! Love latkes, however tehy have to be thin and lacey. I have a us adress, but a canadian url. Though I am weird and do not much like jello, I think the edible jello menorah looks so interesting, quite a creative idea. Fried food… not really for Chanukah, but it has got to be fried ice cream or pastrami egg rolls! Fried foods… my favorite is definitely fried ice cream, second best is pastrami egg rolls. Not really Chanukah related, but still fried! Thanks for the wonderful opportunity, I’m loving your blog! My favorite fried food is Japanese Pizza (sushi) yumm!!! Omg the thought of tempura sushi is making my mouth water… Please pick me for a cookbook, that’s making my mouth water even more! Your recipe looks amazing, any suggestions on what to substitute if you need it nut free? Happy Chanukah my favorite fried treat is sufganiyot filled with caramel! Yum!! Awesome giveaway I don’t have any kosher cook books at all so I would really live to win! Fave fried treat is funnel cake! The best deep fried treats are batter dipped choc bars and oreos!! My favorite fried treat is donuts with Israeli caramel sauce in them (the American versions just don’t taste the same!). Thank you so much for this! What a fabulous, total, Chanukah resource!